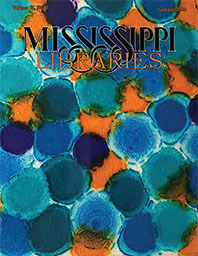 Mississippi Libraries (ISSN 0194-388X) is a quarterly, open access publication of the Mississippi Library Association and is indexed in Library Literature and Information Science (H.W. Wilson) and Library, Information Science & Technology Abstracts (EBSCO). The articles, reports, and features represent the viewpoints of their respective authors and are not necessarily the official opinions of the Association.